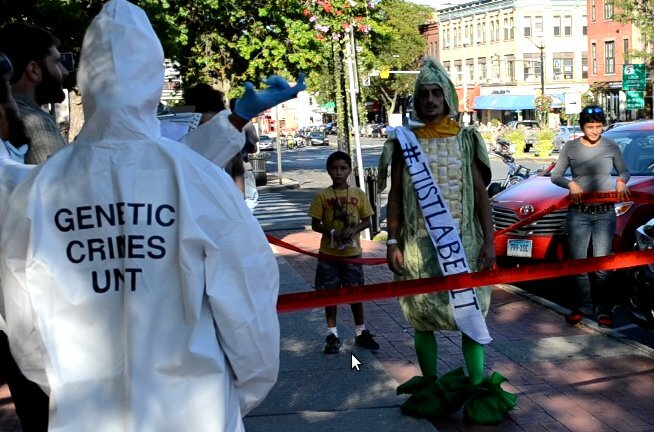 NORTHAMPTON, MA – On Sunday September 16, field agents with the Genetic Crimes Unit (GCU) of Occupy Monsanto equipped with bio-hazmat suits, swept the downtown area for ‘biohazards released by biotechnology giant, Monsanto. 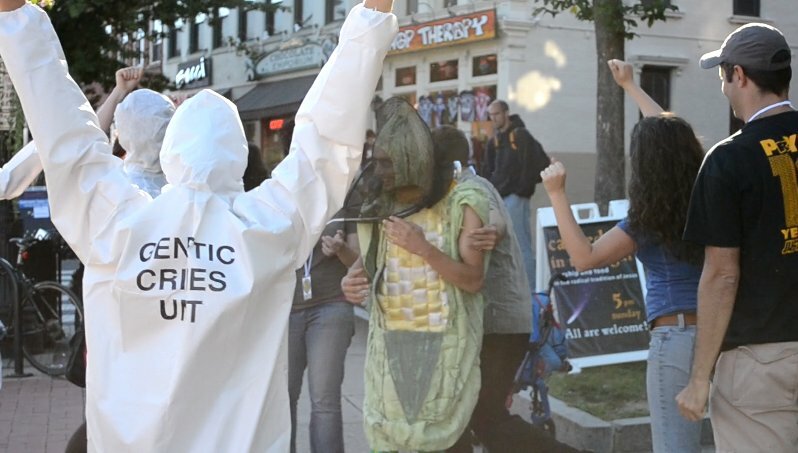 GCU agents, in search of “Frankencorn,” interviewed bystanders to ascertain the genetic contamination of their most recent meal. The GCU is responding to local concerns about the health impacts of genetically modified (GM) foods. “In the Pioneer Valley we are lucky to be able to buy fresh local food from our farmers’ markets and food co-ops. 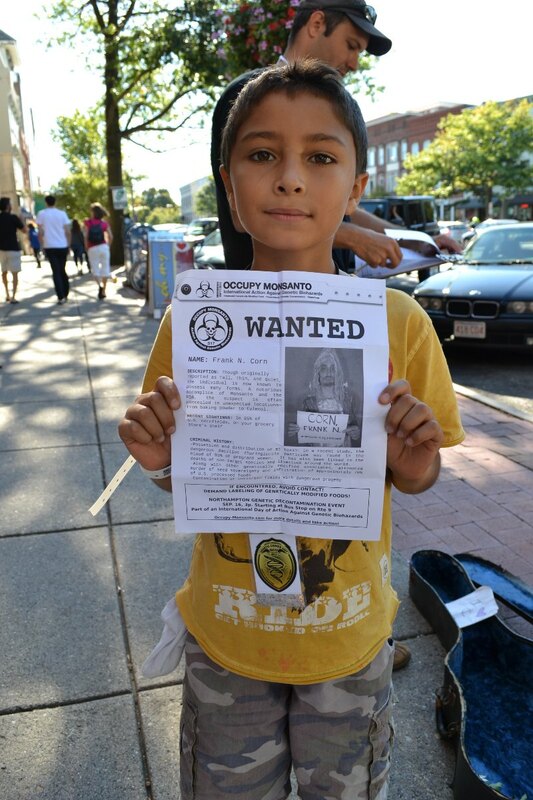 But with the unregulated and unlabeled distribution of Genetically Modified Organisms in fields and food products, there’s no way to guarantee the integrity of our food unless we get vocal and demand labeling of GMOs,” said concerned local resident, Martin Dagoberto. According to their literature, the GCU opposes the continued genetic contamination of the organic food supply, Monsanto’s bid to increase spraying of crops with toxic weed killers like 2,4 D (the main ingredient in Agent Orange) and the health risks associated with genetically modified organisms (GMOs). As highlighted during this year’s Northeast Organic Farmers Association (NOFA) Summer Conference at UMASS Amherst, there are numerous studies linking GM foods with infertility, immune problems, faulty insulin regulation, changes in organ function and other impacts. 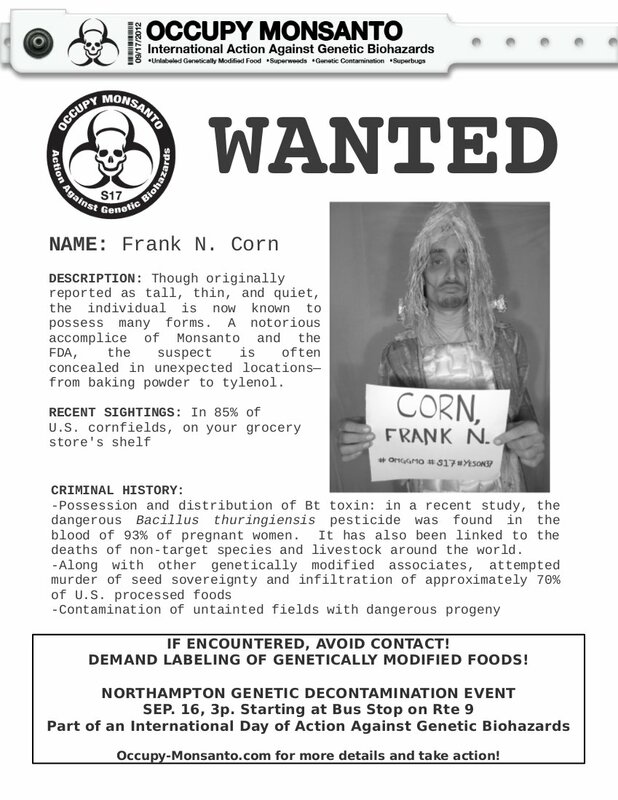 While surveying for genetic contamination, agents spotted the rogue creature known as “Frankencorn,” described on “wanted posters” as a “dangerous accomplice of Monsanto and the FDA, wanted for possession and distribution of the Bt pesticide toxin, now found in the blood of 93% of pregnant women.” Frankencorn was later apprehended by the GCU and labeled as a Genetically Modified Organism. “It’s absurd that the US government refuses to require safety-testing or labeling for genetically engineered foods. We wanted to do something absurd to parallel this absurdity. 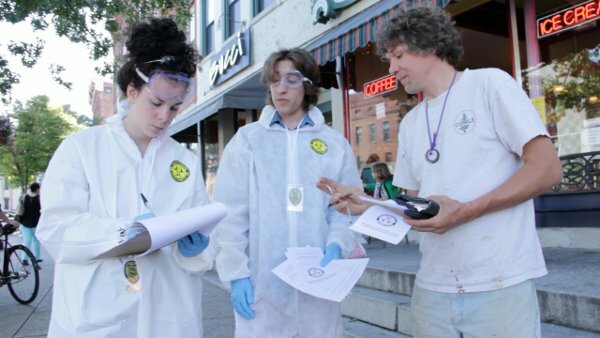 We have a right to know what’s in our food,” said GCU Field Agent Anne Quinn. 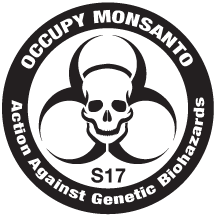 The action was part of a series of international actions against Monsanto, which officially starts on September 17, the one year anniversary of Occupy Wall Street. 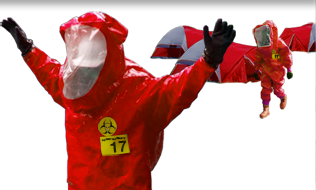 More information can be found at Occupy-Monsanto.com.